Just as was the case a week ago in Fuji, today during the first day of practice for the Chinese Grand Prix, the two F2008s completed a total distance equivalent to two races in the three hours of free practice available. The Scuderia Ferrari Marlboro drivers, Kimi Raikkonen and Felipe Massa did a total of 112 laps (57 for the former, 55 the latter,) double the distance they will have to cover during Sunday afternoon's race. "Today, we completed our usual Friday work, concentrating solely on fine tuning set-up on both cars and on the comparison of the two types of tyres Bridgestone has brought here," commented Team Principal of the Gestione Sportiva, Stefano Domenicali. "We covered a big distance without experiencing any problems. It is always difficult to deliver an instant verdict. We played our part, but I have to say that our main rivals seem to be pretty much on the ball. Now we have to look at all the data acquired to be as well prepared as possible for tomorrow's qualifying, which as usual will be crucial." 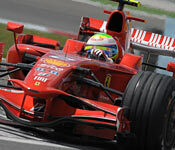 Felipe Massa: "We did a good job and I think we will be competitive at the track. The performance level improved bit by bit as the track got more grip. In the first session, the car was a bit twitchy but then, especially in the second part of the afternoon session, its handling improved. I think we are working in the right direction in terms of car set-up. My aim for the weekend? Obviously I'll be trying to win or at least to get as many points as possible." Kimi Raikkonen: "It was nice to see so many fans in the grandstands to celebrate my birthday. As usual it's difficult to judge the relative strengths of the teams just by looking at the results sheets. At the start, it could have been that our main rivals were quicker but then the situation seemed to balance out and I think that's how it will be for the rest of the weekend. Overall, the car's not bad even if there are still some areas that need to be improved." Luca Baldisserri: "A Friday just like any other: the only difference worthy of note was the wind which changed in direction and intensity, thus making our track work a bit tricky at times. As for the rest, we got through everything on our programme, which means finding the best set-up on the two F2008s and the comparison, both over a single lap and over a distance, of the two types of tyre we have at this Grand Prix. We definitely face a day of hard work to be as well prepared as possible for the rest of the weekend."